Balaia Golf Village is situated within a 30 minute drive of Faro airport and 5 minutes from Albufeira. Wonderfully positioned within a delightfully landscaped garden complex, enabling you to relax by one of the six outdoor swimming pools or to play a round of golf on the complex’s nine hole course. Facilities also include a golf driving range and splendid club house, putting green and practice bunker green, a Health club with a heated indoor pool, gym, steam room and jacuzzi, four outdoor tennis courts. The complex has a restaurant and small shopping terrace. The complex is open throughout the whole year offering facilities whatever your age. We are a recently retired couple who live in the UK on the south coast near Southampton. We try to visit the lovely facilities that Balaia Golf Village and the surrounding areas have to offer as often as we can, spending about 6 weeks of the year in Portugal. 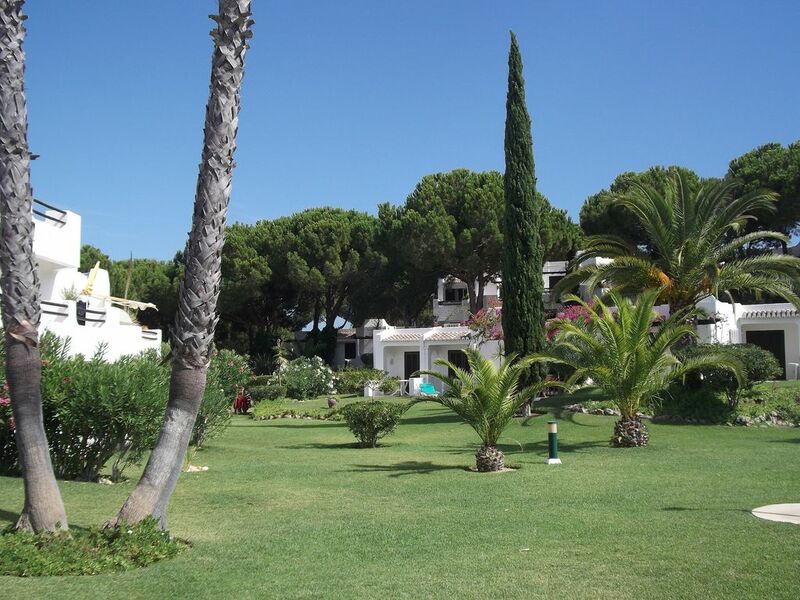 We purchased this property because of the wonderful location and the great facilities in Balaia Golf Village. It is central to most attractions in the Algarve and is only about 30mins drive from the airport at Faro. Separate bathroom with bath, shower, wc, bidet and vanity unit. The internet is a new installation and is a personal secure system for use by guests only. The necessary assess codes provide by the owner. This is available in the complex via reception. Spacious combined lounge and dining room with a double bed settee (sleeping two people) and a single bed lounge chair (sleeping one person). Cosy fireplace seating and a private balcony. Satellite and TV(LED) with an additional DVD player and stereo. All the normal equipment that one would expect to find in a fully supplied kitchen in a home. Fully fitted and well equipped kitchen with storage cupboards, cooker, hob, extractor, microwave, fridge and washing machine. Are to be founded by the pool snack bars. Some beach and other toys such as buckets and spades and bats and soft balls plus surf boards provided. There are four outside tennis courts. Rackets etc. may be hired and professional tuition is available. Balaia has a nine hole golf course and splendid club house with driving range, putting green and practise bunker. There are many highly regarded golf courses within less than 30 minutes drive, particularly the championship courses at Vilamoura. Golf excursions may be arranged via Balaia. Notes on accommodation: All water and electricity is included, the balconies look onto gardens and have garden furniture, chairs and a table with a sun umbrella and sun loungers provided. There is an additional sun terrace facing part of the golf course. Barbecues are permitted and one is offered for the use of guests. Unfortunately pets are not permitted. There is a safe available at an additional cost. Outside: Situated within a delightfully landscaped garden complex that offers sun and shade with an array of flowers and colours throughout the year. Cleaning / Towels / Linen / Maid service: Towels and linen are provided. Linen/towel and maid service normally provided once per full week depending upon length of stay. Services in addition to those provided are available upon request. Other: Entrance hall with additional wardrobe and baggage storage cupboards. Great spot and wonderful service! Great weather during the whole month! There are Bars in the adjacent hotels Alfagar) with great entertainment (no cover charge) and reasonable prices on drinks...Great ambiance, people are friendly...A wonderful variety of languages and cultures.. Overall, a very pleasant stay...thank you to our hosts for making it easy and enjoyable. Many thanks to Malcolm and the staff at Balaia Golf Resort. We would definitely stay here again. Just returned from a week at this apartment. Could not fault it at all. Everything we could possibly need. Lovely & spacious, great settings. Can highly recommend this apartment. Great for families & couples. Thank you for your review. We are always trying to improve and welcome all comments in particular we would like to encourage more online reviews. A casa é excelente porém não dou 5 estrelas porque as camas da sala são bastante más e faltava 1 pano da louça. O complexo é bom mas devia ter mais animação e piscinas menos fundas para os miúdos de 5 a 10 anos andarem á vontade. Balaia is situated near the coast with a host of sandy beaches and attractive coastal walks. Balaia reception is open 24 hours a day and the staff speak good English and are able to answer most questions for you, book excursions, car hire or taxis, plus golf course visits and a range of other services. Balaia is ideally positioned for short excursions to the fishing beach at Olhos de Agua and into old Albufeira town, or for excursions along the attractive Algarve coast to Lagos, Loule, Portimao, or Vilamoura with it’s attractive marina and surrounding golf courses. Also within easy reach are water-parks and a Zoomarine-park, both popular with children. To round off your visit, the Algarve Shopping Mall on the N125 provides a selection of fine shops in a very Portuguese style including a multi-screen cinema. Extended letting periods, particularly out of the main summer season are welcome e.g. one month or longer. These maybe subject to some negotiation based upon the rates quoted. Additional services, are available at an extra cost upon request, such as: a welcome food pack, additional linen/towels, cleaning services, hire of a baby cot or high chair and airport transfer in Portugal. The prices provided are in pounds (GB) and if requested would be provided in Euros. There is a safe provided in the apartment that may be used by guests for a small additional fee paid at reception.